NFL Week 6 betting continues with Chargers vs Browns odds. The Cleveland Browns will be trying to win two consecutive games for the first time. This is since the 2014 season. They welcome the Los Angeles Chargers to FirstEnergy Stadium. The game will be played on Sunday, October 14. It is scheduled to begin at 1:00 PM. ET. The Chargers have played well since their season-opening loss to the Kansas City Chiefs. Winning three of their last four contests. They will be going for their third consecutive win when they face the Browns on Sunday. Los Angeles’ offense has been great so far, with the team averaging 27.4 points per game, which is eighth in the league. Phillip Rivers has looked good so far, completing a career-high 70 percent of his passes for 1,495 yards, 13 touchdowns, and two interceptions. Their running game, led by Melvin Gordon, who has 334 rushing yards and three touchdowns has also been solid this season. Defense has been the biggest issue the Chargers have had this year, with the 26 points the team is allowing this season being 21st in the league. If their defense shows up in this game, the Chargers should be able to get the win. With the team winning one game in two seasons, expectations weren’t very high for the Browns. This coming into this season. However, they have surprised their fans and critics with their performance so far. Defense has been the key to Cleveland’s success this season. Also, the team is holding opponents to 22.6 points per game, which is 12th in the league. The Browns put up a defensive clinic in their game against the Baltimore Ravens, holding their division rivals to nine points in a game that went into overtime. What does this mean for the Browns? The Browns will have a tough task slowing down the Chargers’ offense, but if they can get pressure on Rivers, they should be able to force him into turning the ball over, which has been their calling card so far. 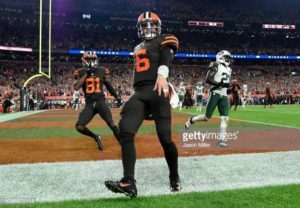 Offensively, the Browns are averaging 22.8 points per game, which is 20th in the league, but they have looked significantly better since rookie quarterback Baker Mayfield was named their starting quarterback. If Mayfield can avoid turning the ball over and the team doesn’t make too many mistakes, the Browns can get the win over the Chargers. The Chargers are favored to win this game by 1.5 points. The over/under on total points scored is 44.5. The Chargers have looked good offensively, especially in the last two weeks. However, they haven’t defeated a team with a winning record so far, and they will face a tough challenge against the Browns, who have made some of the best offenses in the league look average. Take Cleveland +1.5. In conclusion, the Browns have a chance. What do you guys think?